A couple of months ago I did a short post on the difference between daytime and night time populations in the North West of England. I've been interested in this for a while but some other recent work from the US got me thinking about it again. 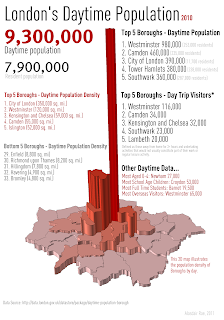 More recently, the London Datastore released data on London's daytime population for 2010 so I thought I'd take a closer look at the data and do something with it. The graphic below pulls out the most interesting data - not least of which is the fact that London's daytime population is 9.3 million! The data are very interesting, but also important. If we want to understand cities and how they work (and how to make them work better) then this kind of information is critical. 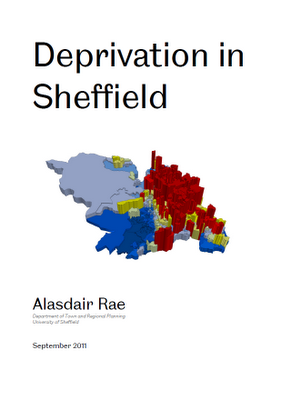 This summer I was asked to write a report about deprivation in Sheffield. I finished this in September and the reaction since then has been quite positive (i.e. people have actually been reading it!). So, I thought I'd link to it directly here and also pull out a few of the main findings from it. Click on the image below to see the pdf - or just click here. In the report I look at how patterns of deprivation in Sheffield compare to 13 other cities in England. 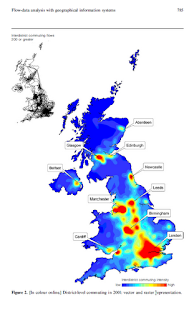 Sheffield is not as deprived as many other cities (e.g. Liverpool, Manchester) but the geography of deprivation in the city means that it is one of the most divided - spatially at least. In one sense this might have something to do with the boundaries of local authorities and how wide an area they cover but, ultimately, it is at the local government level that issues associated with deprivation are most acutely felt so the boundary issue is only part of the problem. I also look at the differences between areas that seem to be similar in terms of how deprived they are. In doing so I draw upon some previous work I did with colleagues at the University of Manchester. The bottom line here is that there there is a need to think more deeply about the different roles and contexts of areas and how they differ from each other - particularly in relation to how policies are formulated. There is also a need to think about issue of social and spatial inequality more widely rather than simply focusing on the 'most deprived' locations, though of course this will remain a policy priority in many cities. In many previous blog posts I talked about my experiments in flow mapping (exhibit 1, exhibit 2 ...). 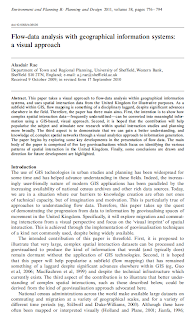 Usually this was about migration or commuting data and in the course of writing an academic paper on the subject I also put together a small website about flow mapping, with some examples. 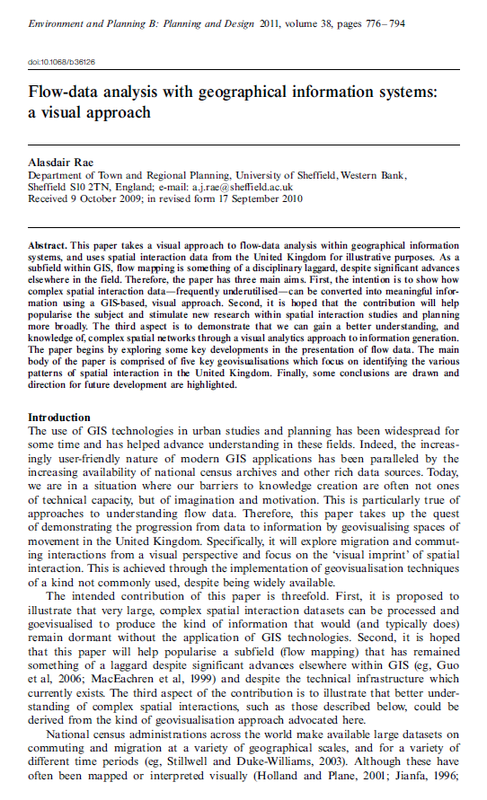 Now I've done a follow-up paper to this which is just out in Environment and Planning B (a couple of extracts shown below). The point of this work is not simply to make pretty pictures. That might be an interesting by-product but it is more about the process of taking data and giving it some kind of meaning by mapping it. This is by no means trivial when you're looking at migration or commuting patterns which link hundreds or even thousands of places. With this much data, you often have millions of individual cells of data, so making sense of it can be impossible without some kind of visual approach - and that's really what the paper is about. It's not really very complicated - at least, not conceptually - but the power of this type of approach is in its ability to generate knowledge from raw data. In short, then, this kind of work is in many ways guided by Kenneth Boulding's maxim that "knowledge is always gained by the orderly loss of information".